We rented snowshoes at REI for a fairly reasonable price. We were also able to purchase our snow park pass there for parking too. The staff at REI was super friendly and helpful. I would definitely recommend renting equipment from them. Even though I complain about the snow, we truly are lucky to have such great outdoor activities year round in our backyard. The drive from our home to Mt. Spokane is less than 30 minutes. Looks like Greek to me! I had no idea where we were going. We finally stopped in a big parking lot to re-evaluate the map. It was decided that we would keep driving further. We pulled out of the lot only to realize that the snowshoeing trail was just off of the parking lot, but the sign was small and hard to see. The mountain had gotten over 6 inches of fresh snow in the last 24 hours so the snow plow had the entrance of the trail blocked. At least we know exactly where to go next time. As we were getting ready we met some nice people in the parking lot who told us which trail would be best for us to take. Then they told us a frightening story about how they got lost up on the trail one time and almost couldn’t find their way out. Lovely. Didn’t need to hear that. I was really cold as we were getting ready and was worried that I didn’t dress warm enough. Once we got going up the trail I was really warm and was able to shed some layers. Even Mr. Healthy Diva took off his coat. The trail was beautiful! I was bummed that my cell phone decided to die (Literally it died. Had to order a new one from Verizon on Sunday) because I wanted to take more pictures then I did. I wanted to go further, but the sound of hungry wolves and/or coyotes had me pretty freaked out. They kept getting louder the further we walked. Mr. Healthy Diva didn’t make me feel safe saying that it was okay- he had his knife with him. I am hoping, depending on our schedules that we can go again soon. Maybe even this coming weekend! Ideally I would like to go in the morning so that we have time go further up the trail. AND not directly after a long run. Bad idea on my part. 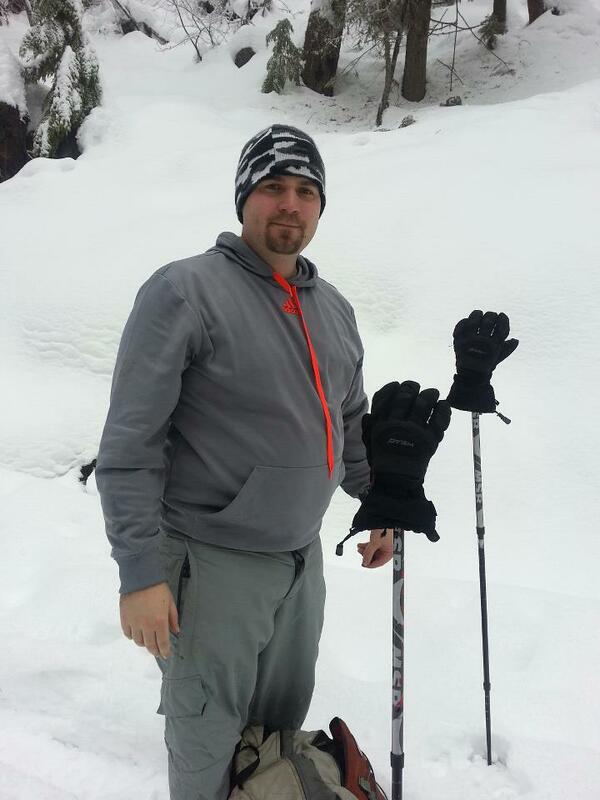 Have you ever been snowshoeing before? Have you ever gotten lost on a hike? My friend in Seattle went snowshoeing w/his friends this weekend and they got lost on the trail & were semi-joking about who they were gonna eat if they were lost for too long. I really should be snowshoeing, since I am surrounded by so many snowy mountains, but I have never done it. I am going to have to brave the mountain snow & do it! Oh my gosh...too funny! If we got lost I would have had a panic attack and then would have cried my eyes out. Do you have an REI in Boise? Just rent some snowshoes from them. It's a great deal. 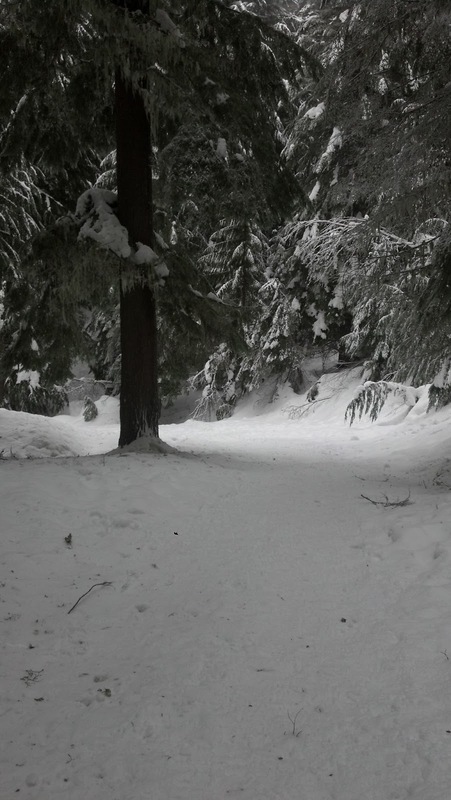 I totally want to go snowshoeing!! What an awesome workout. 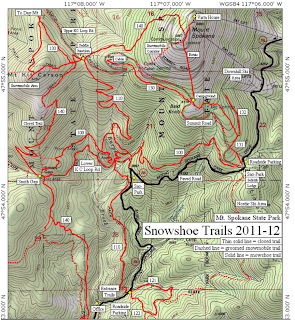 I would LOVE to be able to snowshoe. It would be more than a 30 minute drive for us- like 2 hours. Sorry your phone died! Hope the new one is on the way. Your Utopia pants look cozy. I haven't ordered those, but are they fuzzy? Do they fit tight at the ankles, or are there room for boots inside? You would love snowshoeing Raina! It is something that the whole family could do. New phone was supposed to be here yesterday, BUT apparently Fed Ex needs a signature so I will have to wait until today. I was too lazy last night to drive down to Fed Ex and pick it up. Plus it was snowing super bad and I just wanted to read my book. I have my work Iphone so at least I have something. The Utopia pants have a thin layer of fleece on the inside. They are super cozy and warm. Tons of room for boots at the bottom. I wore my North Face snow boots w/them. That map looks crazy! 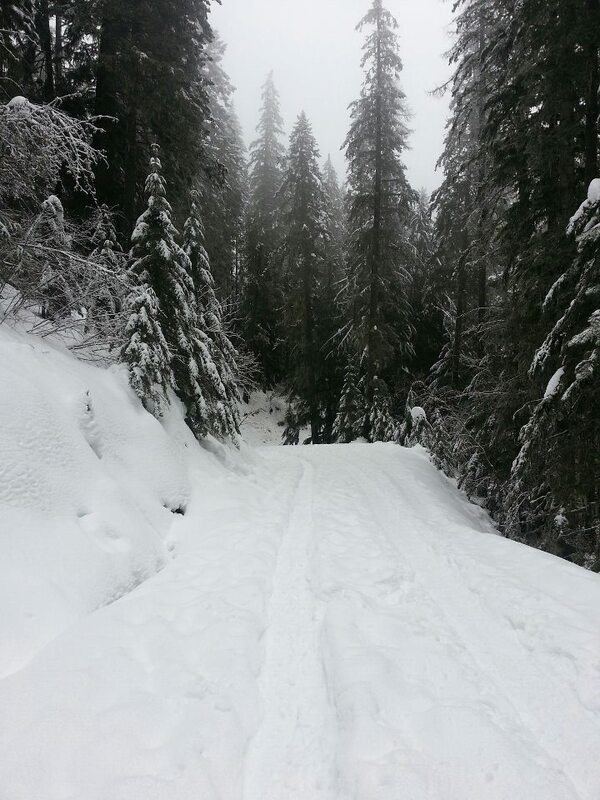 But this sounds like such a fun outing - and the snow is so beautiful! I can't read maps either! I have been snowshoeing before, but it's been awhile. I'd like to go again! It was way more fun than I had remembered. Oh my gosh that is so cool. I hate being cold but I think I would enjoy that experience! Nikki once we got going (only a couple of minutes) I warmed up super fast. I took off two layers! How fun! We don't have enough snow yet for decent snowshoeing. And yes I get lost on the trails all the time. I can't follow one if my life depended. Good thing I have endurance to compensate for all the extra miles I get stuck with. I don't do much trail running, but I can only imagine how many extra miles I would have to run to make up for getting lost all of the time. I went showshoeing once and had a blast. I would do it again but I woudl go with faster people next time. Pretty pictures, looks like a great place to get to be. Going slow would be hard. I think that it would make you more sore too. It is so much fun. I highly recommend it. Okay, seriously we need to live closer to each other!!! 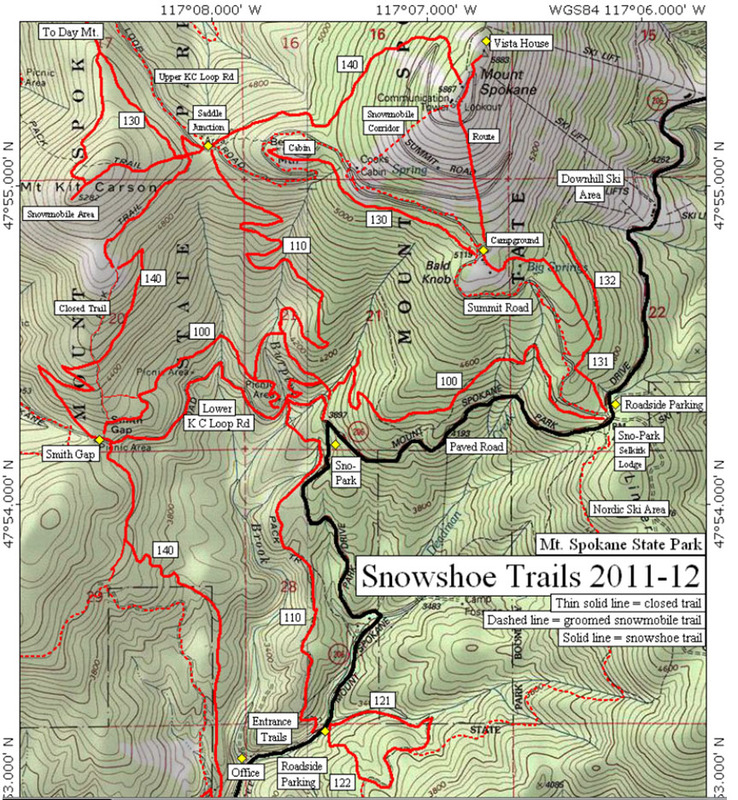 We LOVE to snowshoe. We go frequently and have for the past 5+ years or so. If you are ever down this way over a weekend, lets hook up and go. There are lots of great trails around here. Yes, we seriously do need to live closer!!!!! I think we are going to go again on Sunday because I told Cam I couldn't do another adventure after a long run on Saturday. I can use Sunday as my "active recovery" day. I still can't believe you went after a 16 mile run! It looks like such fun! I have never done that before but I think I will add it to my list of winter activities to try. Oh and I would have been completely freaked by the wolves as well! I can't believe I went either after 16 miles. It won't happen again...trust me! 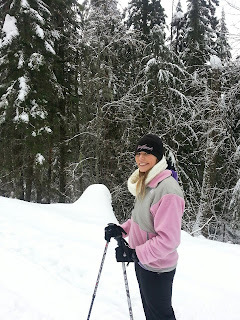 I would also like to try cross country skiing sometime. It looks like an awesome workout. You can rent that equipment from REI too. Maybe I can add that to my list of things to try for next winter. I do need to learn to embrace the winter, I am really working on it! What an awesome idea! Makes me want to try it out! You would love snowshoeing Maureen. It is something you whole family could do! Jealous! I would love to try snow shoeing one day!!! If you try it once, you might become hooked! It is great exercise. 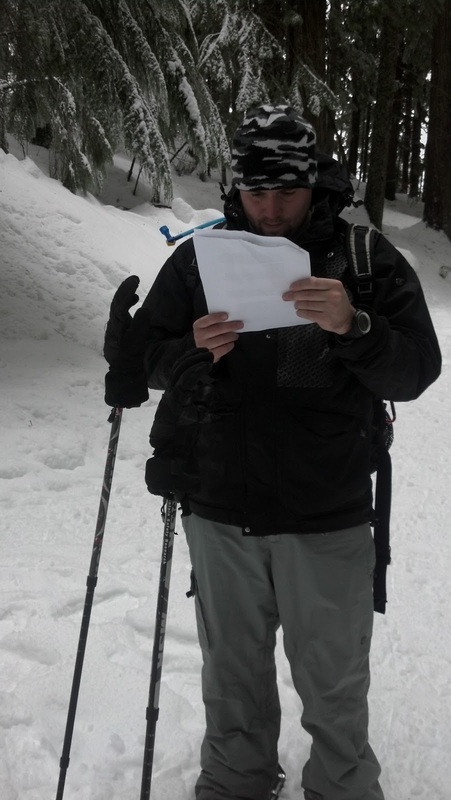 Never been snowshoeing but always wonder about it. Any time we go on a ski trip there are always a bunch of non-skiers that do it. My BF's parents do a lot of skiing at Mt. Spokane - they say it's been awesome lately! Lots of great snow in the mountains. We are lucky to have such great skiing so close. I really shouldn't complain about the snow as much as I do. I need to embrace the winter months and not be a complainer. Looks like it was a fun adventure!! I miss the snow! that looks like sooo much fun!! i would be terrified of animals-i thought i was lost hiking in sedona once. 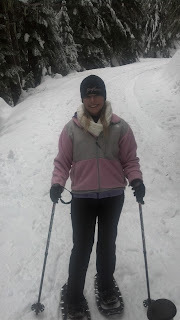 i've also heard snow shoeing is a great workout! It is a great workout- believe me. It took me almost an entire week to recover. How embarrassing!